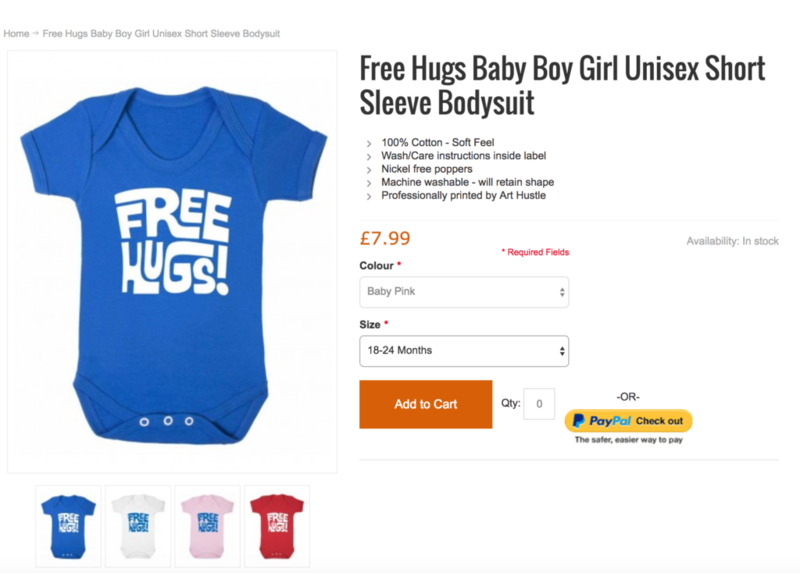 While delivering some Magento training, I was demonstrating how to create Configurable Products and one of the trainees visibly wilted at the thought of creating hundreds of child products to meet her multi-variant product catalogue. However, as she didn’t need to manage stock (as her products were unique, one-offs), I reassured her that she could use Custom Options on a simple product to represent the multi-variants. So, let’s see how this might work in Magento. So, before discussing how to use Custom Options, perhaps a quick refresher on Configurable Products might help. Imagine you sell t-shirts. These come in small, medium and large, and in a selection of colours (blue, white and black). If you need to manage stock (to know how many of each t-shirt you have) then Configurable Products are the way to go. A Configurable Product is essentially a collection of simple products. In our scenario, each t-shirt is a simple product – we have a small blue, a medium blue and a large blue t-shirt. We also have a small black t-shirt, a medium black t-shirt, etc, etc. What your customer sees, however, is a single t-shirt with the option to choose size and colour. Behind the scenes, Magento will only show those t-shirts that have stock – so if you have run out of medium blue t-shirts, the customer will not be presented with that as an option to buy (this is assuming that you are not allowing backorders). So, that’s a common scenario for using Configurable Products. However, let’s assume that you are selling unique products – say a customised cake. The customer is able to choose the flavour and the topping and add a message on the top. As each cake is made to order, you don’t really need to manage stock as such. 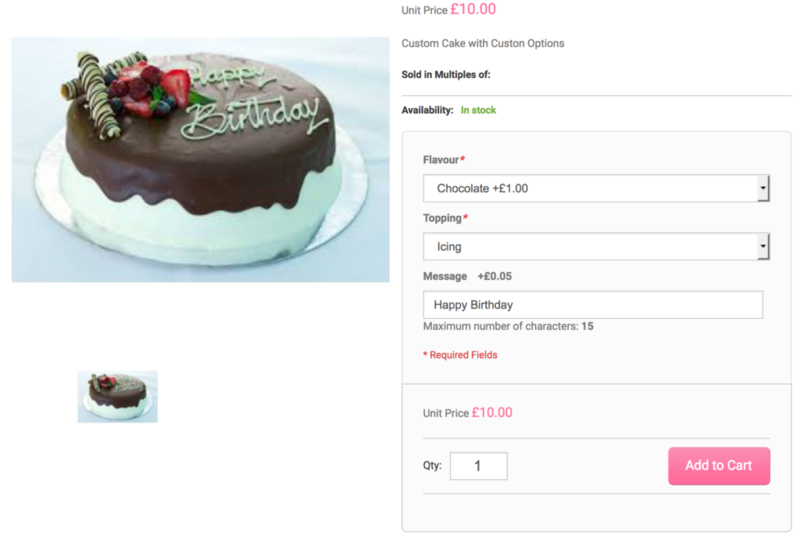 In this scenario, your cake is, in Magento terms, a Simple Product, and flavours, toppings and the message can be represented as Custom Options. The flavours and toppings are of type Dropdown, and the message of type Text. You can increase the price of each option if desired. In the example above, if the customer adds this product, with those selections, to their cart, their cake will cost £11.05. Here, then is a much simpler and quicker way of creating multi-variant products if you do not need to worry about stock management. 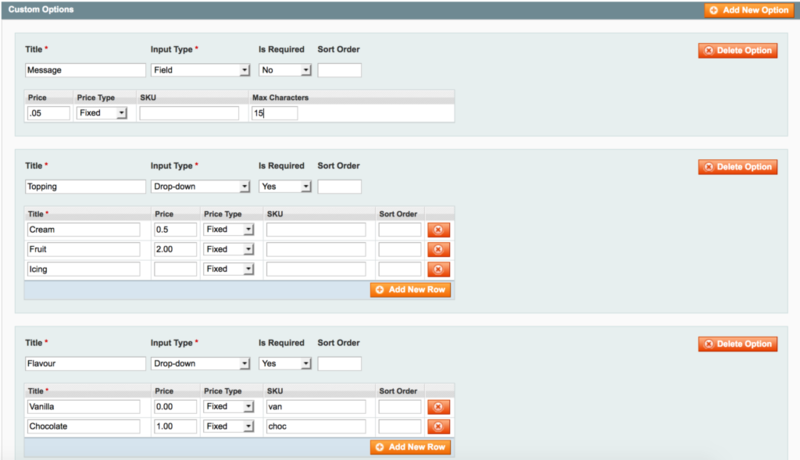 Magento’s Custom Options allow you to quickly create multi-variant products. If you need assistance with your Magento project or shop, please consider getting in touch on 0116 279 3822.